Is a gap year right for your child? Gap years have become more populare in the U.S.
… Prominent in Europe since the 1960s, the intentional and structured break from formal education before college is becoming increasingly popular in the U.S. 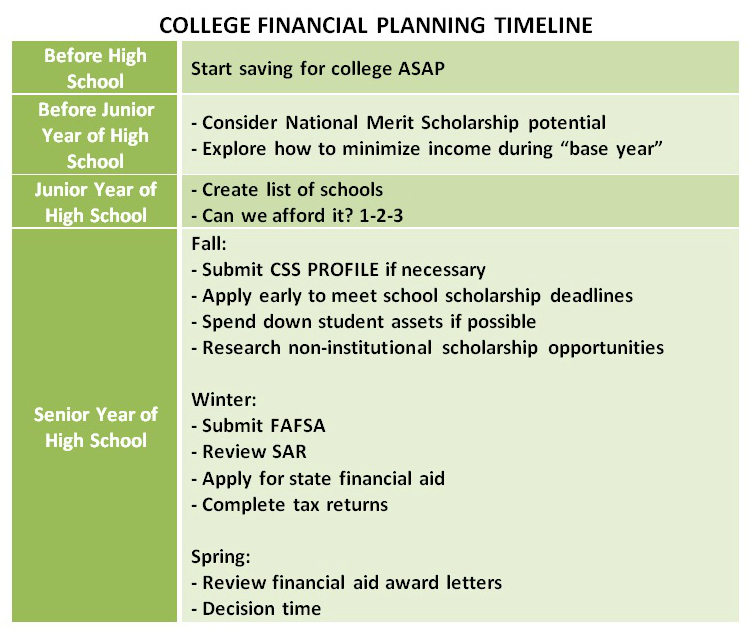 Formally described as a time for “increasing self-awareness, learning about different cultural perspectives, and experimenting with future possible careers”, in many cases a gap year’s most important benefit is simply to help a young person mature and be able to make better decisions about college plans. While some gap programs cost about as much as a year of college, many other options are more affordable. Sometimes a gap year is a time to earn extra money for college. Simply living at home while working is a basic option, perhaps with classes or travel included for personal growth and preparation for college. Other low-cost options include domestic or international travel along with internships. Before you design your gap year plan, sit down and really think about what interests you want to explore or what countries spark your interest. Combining an interest (such as learning Spanish) with a low-cost opportunity (such as Au Pairing in Spain) ensures your gap year will be meaningful to you as well as cost-effective. WWOOF and Help Ex are two resources for matching students with farms, homestays, ranches, lodges, B&Bs, backpackers hostels and other options where volunteers receive room and board in exchange for work. Dynamy’s program of mentored internships has been personally recommended in one situation I know. Families are becoming more receptive to gap years, and many believe that it is a good way to lower the chances of college students wasting time and money in college while they try to figure things out. Naila Francis, “Gap years gain popularity as students seek purpose, passion”, The Intelligencer, July 13, 2014. Julia Rogers, “An Affordable Gap Year”, My College Planning Team, November 6, 2014. Posted in back to basics, before college, cutting college costs -- ideas for students, trends | Comments Off on Is a gap year right for your child? What’s the point of helping students graduate from high school if that doesn’t prepare them for college and career success? This question arises from a study seeking ways to improve the public schools in Yonkers, New York. The holy grail for urban school systems has long been to increase their graduation rates. In other words, hand out those diplomas so students have a chance to make it. But the people at Yonkers Partners In Education, a private group obsessed with helping Yonkers students thrive, began to see that mere graduation is not enough. They wanted to find the keys to preparing students for college success…. But too many Yonkers students were not making it in college. YPIE began to doubt the point of helping students graduate from high school if they weren’t ready for college work. The study, College and Career Readiness in the New York State Public Schools, found the utterly predictable “strong link between poverty and students’ readiness for college”. While some study results were not surprising, other findings contradict conventional wisdom by showing that “class size and per-pupil spending” have little correlation to student readiness for college. New York high school graduation standards are too low. A major problem, Kroll found, is that a high school diploma has been too easy to attain in New York. Students need to pass only one Regents exam in math, for instance, to earn a Regents diploma. Because of the way the state curves its algebra exam, a student could get a 65 “passing” score on the June 2013 exam by earning only 34 percent of all points on the test. The next challenge will be finding the elusive best practices in high-performing schools and then implementing them in the low-performing schools. The ultimate goal is to identify districts that outperform their poverty levels, analyze how they do it and share the results. Gary Stern, “Statistics show poverty’s impact on student success”, Journal News, December 20, 2014. Bud Kroll, College and Career Readiness in the New York State Public Schools, Yonkers Partners in Education, YPIE Research Report 14-01, May 2014. 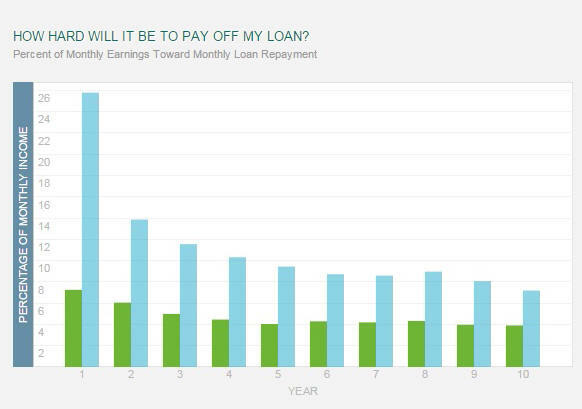 The Undergraduate Student Loan Calculator offered by the Hamilton Project allows you to illustrate what percentage of your future earnings are likely to go toward paying off your student loan. Among other variables, you can select your major course of study. Here’s an illustration comparing a petroleum engineering major with an ethnic studies major, showing a dramatic difference in outcomes, particularly in the first year after graduation. The ethnic studies major starts out paying almost 26% of his earnings toward his student loans. Income is based on the median earnings for that major. The loan assumptions are based on average student debt of $26,500 as of 2012 and current federal student loan interest rate of 4.66%. Run your own illustrations at the Hamilton Project site.